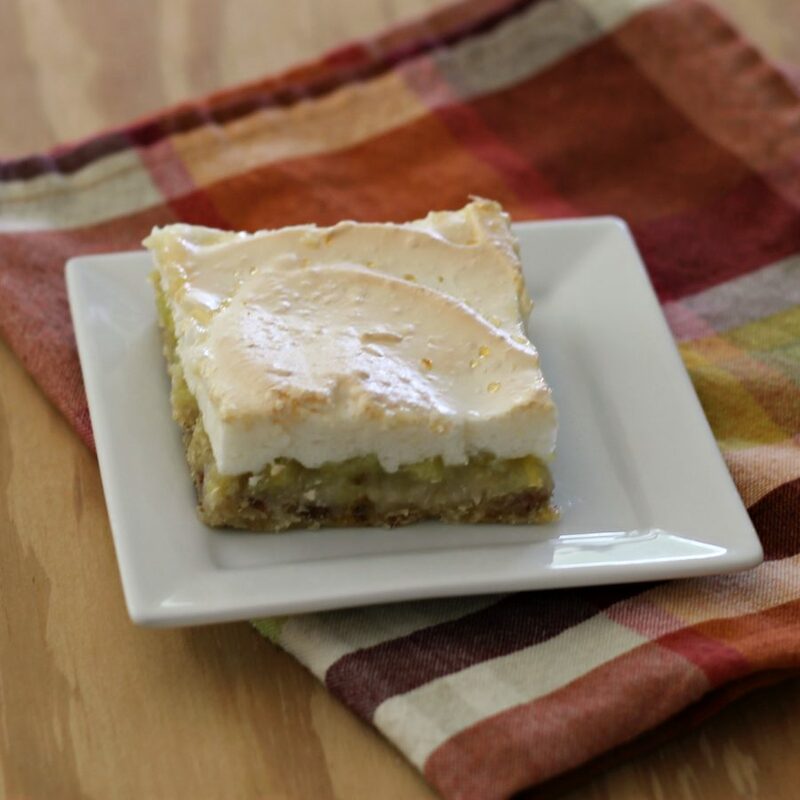 A spring time favorite.. rhubarb cake or might call it rhubarb bars. This is the second time around for this recipe on my blog. I decided to add it again because it really is one of our all time favorite rhubarb recipes. This recipe has been around for as long as I can remember. 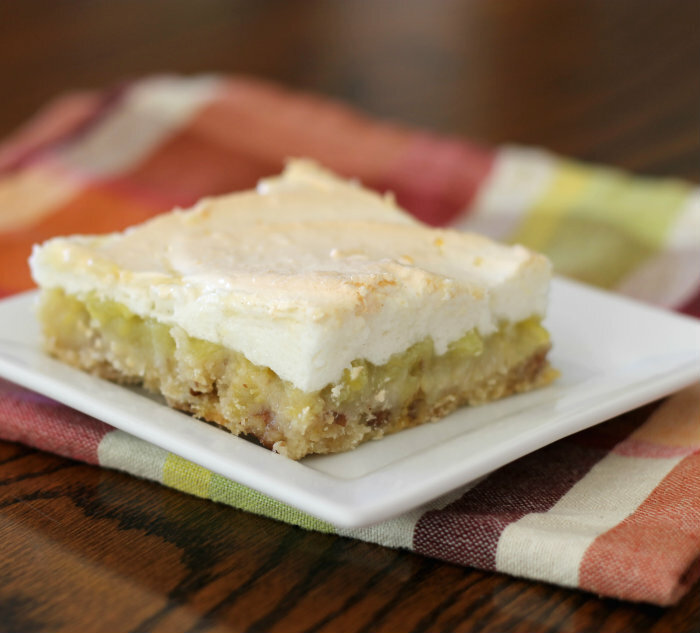 When I was a kid my mom would pick rhubarb as soon as it was ready in the springtime and make these bars. They were my dad’s favorite and I would say that they were one of my favorites too. You will see that the name of the recipe is rhubarb cake… but my family has called in rhubarb bars forever. I am not sure where my mom got this recipe from to tell the truth, as I mentioned it has been around for as long as I can remember. So who knows who chose the name. But as far as I am concerned it doesn’t matter if you call this a cake or if you call it bars, it is just plain yummy. 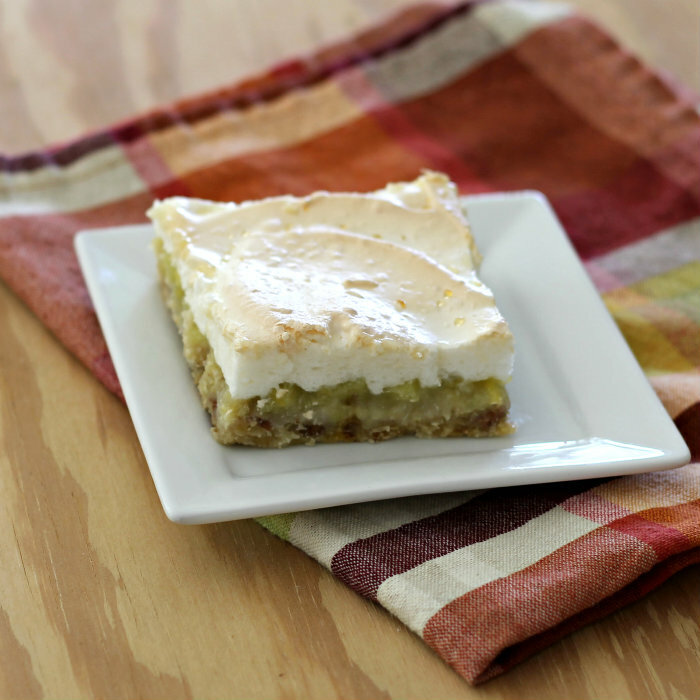 I love the sourness that the rhubarb brings to these bars and the sweetness of the meringue. Oh and I would highly recommend that you add the nuts to the crust, I have made these without nuts and with nuts. The nuts definitely add flavor to the whole outcome. Unless if you are not a nut lover or allergic then forget the nuts. Take the dry ingredients and add them to a medium bowl, mix until blended. Cut in the shortening, then mix in the egg yolks. Pat the crust into a greased 9 by 13-inch pan bake for 10 minutes in a oven that has been preheated to 350 degrees F.
While the crust is baking prepare the filling. Add the rhubarb that has been cut into pieces into a large bowl. Beat the eggs with a fork and add to the rhubarb Add the sugar and flour and mix well, mix in the vanilla. Once the bars have been removed from the oven, pour the rhubarb mixture over the hot crust. Place it back into the oven and bake for an addition 30 to 45 minutes until the rhubarb is tender and the mixture is set. Just before the baking time is completed take the egg whites and beat adding the sugar gradually, when you have stiff peaks add the vanilla and beat in. Remove the bars from the oven after they have been baked for the 30 to 45 minutes top with the meringue. 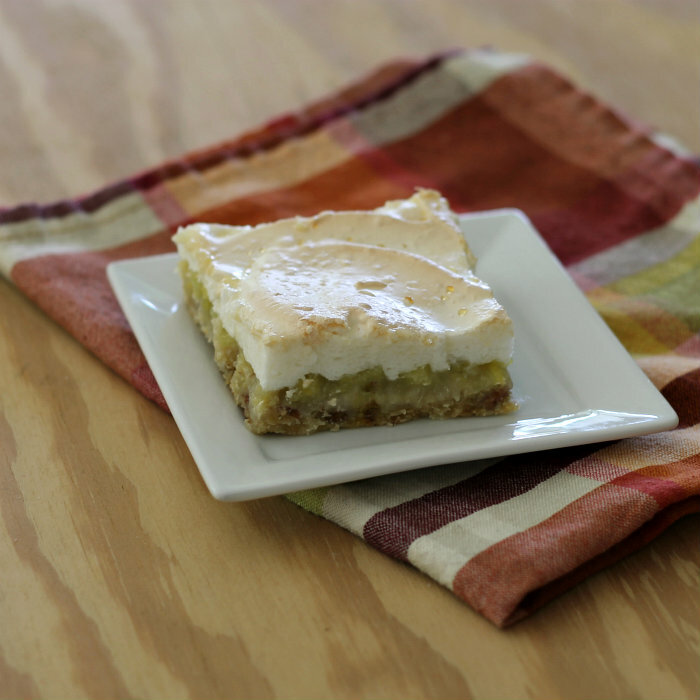 Place the bars back into the oven and bake an additional 10 to 15 minutes or until the meringue is a golden brown. These bars look wonderful! I have never baked with rhubarb before. Will have to change that soon! I haven’t baked anything with rhubarb this year…it looks fantastic, Dawn.